Should I Pay My Fed Student Loan With a Credit Card? Can I Pay My Fed Student Loan With a Credit Card? Lenders servicing federal student loans cannot accept credit card payments due to U.S. Department of the Treasury regulations. However, you can still make payments on your account with a credit card if you use an intermediary or if you are late on your payments. Perhaps the bigger question to ask is if you should do so, as opposed to asking if you can. While making payments with a credit card carries some benefits with it, considerable risks come with those transactions as well. Businesses like Plastiq will accept credit card payments in order to write checks to creditors on your behalf. Plastiq makes money by charging a 2.5 percent fee per transaction, as of 2018. This service or others like it can be beneficial if writing your own check is not an option for some reason. For example, you may not have a checking account or you may not have enough money in your account to cover a check. This way, you still can use credit to pay a creditor that does not accept credit cards. The value of your credit card's rewards program needs to exceed 2.5 percent of the amount of your payments for there to be a benefit if you are using an intermediary that is charging a transaction fee that high. As of 2018, it's unlikely that you'll find a card with such a generous rewards program. Most cards earn somewhere in the neighborhood of 1 percent to 1.5 percent cash back—or the equivalent in points—on most purchases. They might double or triple those points on certain purchases related to travel or dining out, but you won't get that kind of return on a payment to an intermediary service. If you absolutely need to use your credit card to make your payment on time, it's still beneficial to use a rewards card because it will allow you to recoup at least some of the transaction fee you paid to the intermediary service. 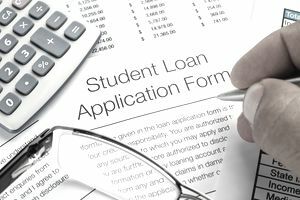 If your student loan has an unusually high interest rate, you might find it worth your while to use an intermediary service to pay off a large chunk of the student loan and shift that balance to a credit card with a 0 percent introductory rate. It only will be worth it, though, if your student loan interest rate is higher than about 4.5 percent and if you are 100 percent certain you can pay off the credit card balance during the introductory rate period. For example, if you have a card with a 12-month introductory rate and you use it to have an intermediary service pay down your student loan by $1,200, you would be charged $30 by the intermediary service, giving you a credit card balance of $1,230 that you would need to pay off in 12 months. That amounts to $102.50 per month. A 4.5 percent interest rate on your student loan would add up to just short of the same $30 fee. Most federal student loans have relatively low interest rates, so most people aren't paying much more than 4.5 percent if they're paying more than that at all. However, if you are stuck with a higher interest rate, this option is worth considering. Just be sure to do the math on your own specific situation to be sure you're actually saving money. Rewards programs for credit cards are valuable only if you are paying your balance in full every month or using a card with a 0 percent introductory rate. Once you start carrying a balance and interest charges start kicking in, it doesn't take a high balance to eat away any rewards that have been earned. So, even if you are in a situation where you must use a credit card to pay your federal student loan, you need to be able to make sure you are able to pay off your credit card balance every month. Intending to do this is often easier than actually following through. If unexpected expenses pop up and that credit card balance starts to grow, the relatively low interest rate you had for your student loan becomes much larger as it starts to compound along with the rest of your credit card balance.